Robin's Eccentricities: Mind **blown** WHY? Sharing all my eccentricities with you. Cooking, canning, baking, sewing, gardening, emergency preparedness and some military issues. I am looking for a specific record in Mikey's medical history. I have thousands of pages that I have to go through. (On the chronological sheet there are records missing for almost 2 years...the ones I need too!) Anyway, I saw something that has me so upset and dumbfounded that I don't know what to do. This Doctor mentions Huntington's disease. That IS a form of dementia. It is also one that the second neurologist ruled out. But if he suspected it ONE YEAR AGO why didn't he do anything? Why didn't the Primary Doctor see that and put in a referral? If those referrals had been made to neurology the MRI would have been done 1 year sooner. It was bad enough that I had requested a referral to neurology 1 1/2 years before it happened. Now to know that a Doctor at least wanted to rule out a form of dementia and nothing was ever done makes me sick. Why didn't the Doctor even talk to us about it while we were there? 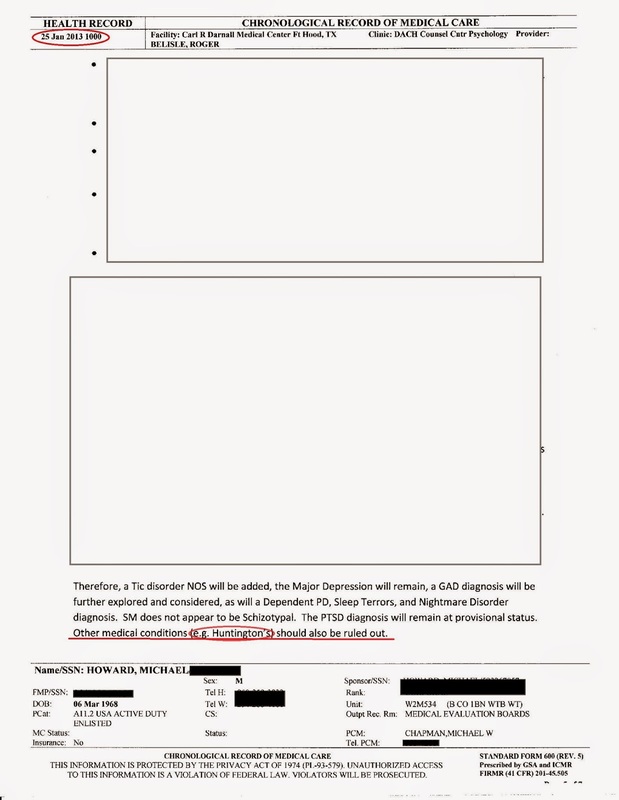 Why is it stuck in the bottom of a medical note only to be discovered long after the fact? There are always too many "why's" to be asked with the Army. I'm on a mission today to find those 2 years of missing records. I also want to find some answers as to why nothing was done to rule out Huntington's. I'm sure I won't get them. They like to pass the hat around here so no one gets to take responsibility.